I’ve been seeing Throwback Thursday (aka #TBT) stuff all over the internet lately. Looking at people’s old pictures is usually good for a laugh, but I haven’t jumped on board and participated at all. But, instead of posting pictures from when I looked like boy and/or was shaped like a rectangle, I’m going to tell some stories and recap some races from my pre-blog running days. (Of course, I’ll add some pictures when I can). My first real experience with running was when I played soccer in high school. We ran a lot. And I hated it. My coach (for the first two years) was also the school’s track coach, so I always assumed we ran so much because of that. However, after he left, we did not run any less so it’s possible we just ran so much because it made us better at soccer. Brian Andreas’ take on soccer. He couldn’t be more right. 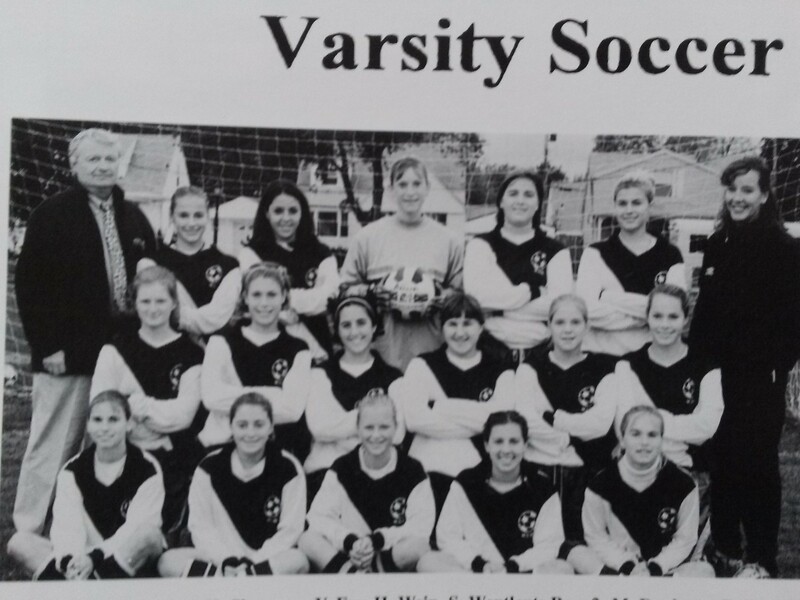 The kind of running we did on the soccer team was different than the kind of running I do now. We’d show up at practice and stretch and then run as a team for 1 to 2 miles (at least this is an approximation of what I think we did, but it was something like 15 years ago, and we never measured it). We ran as a team, and occassionally we’d sing songs to help the time pass. We ran in our cleats, and mostly ran on the grass, but also on sidewalks. I always liked the sound 20+ pairs of cleats made when running on concrete (although, I know it wasn’t good for our shoes, and probably not our legs either). In between all this running, we also played soccer. I don’t remember a lot of the specific drills we did as much as I remember all the running, because I never felt as strongly about the soccer part of soccer practice as I did about the running part. The soccer part was fun, the running part was torture. This is a picture of a picture out of my yearbook. Can you find me? Middle row, 3rd from the right. When searching for it, I found something else that I completely forgot. I used to sign my own yearbook/write myself a note every year. I’m embarrassed for myself. I played after school soccer from 3rd to 5th grade, and pretty much all I remember is running. That and not understanding off-sides at all, so they stuck me on defense every.single.game. Ah, soccer. I played midfield and even during games, I mostly just ran back and forth. haha. I loved it though. Ahh the offsides trap… it was legendary, wasn’t it? Except for the few times it didn’t work and I had to save a breakaway…. I can’t imagine how scary it must be to be the goalie when the entire defense just sprints up to half field! I don’t know how you did it. I used to love when the other team would get mad and yell at each other for being off sides. It was so funny!